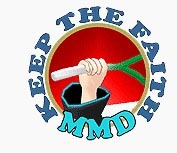 What do I do with MMD Dummy Bones? I always get confused about which accessory is connected to which dummy bone. How can I remember what each of my dummy bones does? Keep a list of your Dummy Bones! 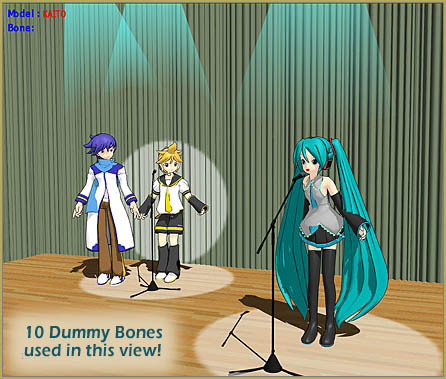 When you first start using MikuMikuDance, dummy bones seem like a strange idea. Invisible “bones” that you can move individually around your stage. You attach accessories to your MMD dummy bones and those accessories hang from those invisible bones. But … once you get into it … you find that those invisible bones are some of your most powerful tools! There are 10 dummy bones behind the scenes in that view of my stage! One for each accessory you see … the drapes (left side and back-drop), the microphones, the floorlights (one of which I turned on its edge to “shine” on the drapes), and the three overhead spotlights. It was important to me to keep track of each accessory’s dummy bone because I animate the motion of several of those lights … the floorlights move to follow the models as they walk onto the stage … and the overhead spotlights “swivel” as if making those bright spots (the floorlights) on the floor. I soon found that I needed to jot down a list of what was attached to what … and I also kept track of the precise XYZ positions of a few of those bones. Amazing the amount of confidence you gain as you get control of the dummy bones. You don’t have to remember all of the details … you have it written down! As you can see … I quickly used-up the 15 bones that you get when you load the dummy bones. That turns out to be no problem! You can load the Dummy Bone again! As I added more lights and accessories to my stage, I simply added more dummy bones. Doing so makes it even more important to keep a list of what’s attached to what! comment faites-vous les personnages je veux bien savoir mais moi je vais en faire refaire les Power puffs girl !!!!!!!!!!!!!!!!!!!!!!!???????????..?????????????? I love the Powerpuff Girls… and I have not yet seen any of them in MMD! Naaa. Those aren’t Powerpuff Girls. THESE are the Powerpuff Girls. Those PPGs are better… but they still have fingers and small heads. I couldn’t get the download to work… just tons of ads.Those guys aren’t “perfect” enough, anyway… sour grapes. You can also attach more than one item to a single Dummy Bone.